Tonight President Trump dined with military leaders in the Cabinet Room. The president answered a few questions from the media at the beginning of the briefing. 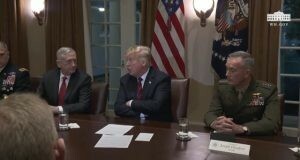 Defense Secretary James Mattis is seated to President Trump’s right, and Joint Chiefs of Staff Chairman Joseph Dunford seated to his left. President Trump delivers remarks then answers more questions about: Jamal Khashoggi; the Central American migrant caravan; and Space Force. Lieutenant Colonel Ryan D. Skaggs, USAF, Director for Defense Policy and Strategy, National Security Council.